One of my favorite areas of science has always been chemistry, so this week Roadtrip-'62 ™ takes a look at a random selection of chemistry news from 1962. My 9-year old self was reading books from my elementary school library about chemistry and on becoming a chemist back then. I did not yet have a chemistry set, but would get one for Christmas at the end of the year. It was a Skilcraft set with chemicals like those shown below and had a book, “Exploring Chemistry”, of fascinating experiments and lots of potentially dangerous chemicals! Things have changed in the United States, with the Federal Hazardous Substances Labeling Act of 1960, the Toy Safety Act of 1969, the Consumer Product Safety Commission of 1972, and the Toxic Substances Control Act of 1976 all regulating what you can sell today in a chemistry set. I suspect they’re not as much fun as such sets were back in 1962. In addition to reading about chemistry, I could watch Mr. Wizard on TV. Don Herbert created and starred in "Watch Mr. Wizard" from 1951 through 1965 and dazzled a generation of kids with his experiments in science. We saw physics, electricity, and especially chemistry demonstrated dramatically every week, from his “garage” laboratory. And the show spoke to us in part because he included a boy or girl in each broadcast. As Don Herbert later noted, "What really did it for us was the inclusion of a child. When we started out, it was just me up there alone. That was too much like having a professor give a lecture. We cast a boy and girl to come in and talk with me about science. That's when it took off. The children watching could identify with someone like them." The show collected numerous honors during its run, including a Peabody Award, four Ohio State awards and the Thomas Alva Edison Foundation Award for "Best Science TV Program for Youth." Some people have speculated that Don Herbert may have been personally responsible for more people going into the sciences than any other single person in the United States. After "Watch Mr. Wizard" ended its run in 1965, it came back for the 1971 season and was relaunched as "Mr. Wizard's World" on Nickelodeon from 1983 to 1990. So what types of chemistry was making news in 1962? Well, basic elemental chemistry for one. It was found that the element Technetium, which was thought to be manmade and not found in nature, did in fact exist in trace amounts in a Uranium ore sample from the Belgian Congo in Africa. Technetium is a chemical element with symbol Tc and atomic number 43 and is the lightest element whose isotopes are all radioactive; none are stable. The small amount of Technetium that is found in the Earth's crust is a spontaneous fission product in Uranium ore or the product of neutron capture in Molybdenum ore. Manmade Technetium was first produced in 1937 and is a silvery gray metal. It is a common by-product of spent fuel rods from nuclear reactors, which contain various fission products. However, all major reactors that produce Technetium for commercial use were built in the 1960s and are close to the end of their life, creating a potential supply gap in the future. It is used in nuclear medicine for a wide variety of diagnostic tests. The element Xenon was first made to form chemical compounds in 1962. Xenon is one of the general non-reactive “noble” gasses, which were thought for many years not to form any compounds with other elements. This was proven false by researcher Neil Bartlett, who synthesized the compound xenon hexafluoroplatinate. This was a rare case of a single person, working alone to make a major scientific discovery. 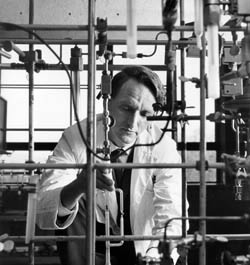 Several years before 1962, Bartlett had produced a red solid during experiments with Flourine and Platinum, but the compound defied identification until he and his graduate student Derek Lohmann did extensive research and discovered that the Oxygen had formed positively charged ions even though it usually formed negative ions. Bartlett theorized that if this platinum hexaflouride could so oxidize Oxygen, then it might also be able to achieve the "impossible" task of oxidizing Xenon, one of the “noble” gasses. In March of 1962, he managed to produce the world's first noble gas compound, orange-yellow solid xenon hexafluoroplatinate, while working alone in his laboratory. Within months, other chemists successfully repeated the experiment. Today, noble gas compounds are used as anti-tumor agents against cancer, a cleaner to remove radioactive gasses from uranium mines, and in lasers for eye surgery. Compounds of the element Berkelium were also first created in 1962. Berkelium is a completely artificial element, produced by bombarding another manmade element, Americium, with Helium nuclei at high speeds. It was first produced in 1949 at the University of California at Berkeley and took nine years to make enough to see with the naked eye! By 1962 there was enough to experiment with and its first chemical compound, berkelium dioxide, was created. Another compound, berkelium chloride, was also created that year. Like the other elements in its part of the period table, Berkelium accumulates in skeletal tissue and is therefore highly toxic to humans. There are no know uses yet other than basic research and it has no known biological role. Beyond basic research, there were also commercially important chemicals in the news in 1962. The DuPont chemical company used the advertising slogan, "Better Things for Better Living...Through Chemistry", from 1935 to 1982, and this sums up nicely the feeling of the country through that period. Here’s a couple of chemical discoveries from our favorite year. A chemical branded as Texanol by Eastman Chemical, was created and found to be effective in softening particles in latex paint, allowing them to fuse into a continuous film and form a hard surface as it evaporates. Having better evaporation rates, Texanol was preferred to water-soluble solvents in early formulations of latex paint. In 1962, latex paints were just beginning to become popular and consumers were moving away from the older oil-based paints. Today, latex paints dominate the market. Research into new medicines also continued and you can find more information on the state of medicine at the Roadtip-'62 ™ Medical Progress in 1962 page. The general anesthetic Ketamine was first synthesized in 1962 at Parke Davis Laboratories. The company was searching for a new anesthetic to replace the hallucinogen phencyclidine (PCP), which was deemed not suitable for use in humans. PCP produced severe hallucinogenic effects when patients regained consciousness, whereas Ketamine produced only mild effects. The drug was patented in Belgium during the next year, and approved for use in the United States in 1970. Unfortunately, even the minor hallucinogenic side effects have led to its abuse as a recreational drug. And the cancer treatment drug Taxol began its journey in 1962, when US Department of Agriculture botanist Arthur Barclay collected bark and other samples from Pacific yew trees in Washington state. His work was part of a program that collected and tested an incredible 30,000 samples from plants between 1960 and 1981! It was two years later that other researchers discovered that extracts from the Pacific yew were toxic to living cells. The most toxic compound was isolated from the bark of the tree and called paclitaxel. But it was not until 1979 that more work discovered how the chemical worked, by stopping cell division. After further development and testing, the drug Taxol was refined and is now used in the treatment of breast, lung, and ovarian cancer, as well as Kaposi's sarcoma. Joseph P. Kennedy International Award in Mental Retardation – Dr. Asbjørn Følling, awarded in December 1962. For work done in the 1930s discovering the disease phenylketonuria, which hinged on the finding of the chemical phenylpyruvic acid in urine. Ending where I began, you can find more about children’s chemistry sets in this video from the Chemical Heritage Foundation in Philadelphia, Pennsylvania. They have the largest collection of chemistry sets among public institutions in the United States. Rosie Cook of the foundation gives some info on the rise and fall of the sets. I’ll be experimenting with mine down in the basement and see you next time on Roadtrip-'62 ™!